Symphony #5 "Andante con moto"
You read her books, you saw the movies, now get the CD. The Jane Austen Companion is Nimbus' invitation for listeners "to recapture the romance of Austen's world with music of the period." However, the quintessentially English Austen was born in the 1770s and died in 1817, so J.C. Bach and William Boyce really were before her time, and it's unlikely that she would have known the rudely revolutionary music of French composer Étienne-Nicolas Méhul. Perhaps it's better to think of this as orchestral music to read Jane Austen's books by. Most of the selections are slow and quiet, and therefore, not interruptive. A hazy summer sun hangs over this collection, which reminds me how striking it is that the characters in Austen's novels rarely seem to work for a living – they just spend their time going to each other's homes and parties. With a single exception, no complete works are offered; instead, Nimbus has compiled restful Andantes, serene Adagios, and calming Larghettos from their catalog. Original instruments are used throughout, adding to the period flavor. The performances are appropriately sleepy. 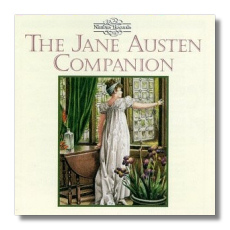 Too uneventful for continuous, attentive listening, The Jane Austen Companion is nevertheless a good companion for late evenings or for long afternoons in the hammock – with or without a book. So far, it has convinced me that I need to explore Mendelssohn's String Symphonies – the Andante from the fourth of these symphonies has utterly charmed me. Classical compilations with a literary theme are rare enough to make this CD worth bibliophiles' attention.